SuperHeroHype has your exclusive first look at the character Grant Alexander in Activision's X-Men Destiny, coming to the Xbox 360, PlayStation 3, Wii and Nintendo DS in September. In X-Men Destiny, players control the fate of one of three brand-new mutant characters forced to choose between saving humanity or ensuring its destruction. The branching storyline, penned by acclaimed Marvel writer Mike Carey, features a deep element of choice, allowing players to customize the path, powers and development of their character and to decide their role in the mutant cause alongside, or against, some of Marvel's greatest X-Men franchise characters, such as Magneto, Cyclops, Wolverine and Gambit. In this third-person action/RPG, X-Gene enhancements deliver a deeper level of customization to players’ powers, with a chance for players to experience the abilities of their favorite X-Men mutants. Gamers will evolve their mutant skills in unique ways and engage in fast and furious combat, spectacular combo-driven attacks and rewarding finishing moves against a variety of opponents bent on defending their beliefs. Grant is in San Francisco hoping to land a starting spot for the University of California, Berkeley, Varsity Squad. Oblivious to the world tensions, Grant doesn't see that the peace rally and threatening protesters around him have any connection to his life. When he discovers his own mutant powers, Grant is faced with the realization that mutant/human relations are absolutely his problem. SuperHeroHype: Tell us about Grant and his background. Justin Farren: Grant is pretty much your all-American boy. He grew up in Sandersville, Georgia and had an affinity for sports from a very early age. His dream is to become a pro football player so he enrolled at the University of California at Berkeley where he is currently vying for a starting position on the football team. SHH: What do you think gamers will like about playing as Grant, compared to the other two new characters? Farren: I think one of the coolest aspects about the "X-Men Destiny" characters is that each one is unique. We really wanted to differentiate each of the characters in terms of their backgrounds, ethnicity and personality. The goal was to provide something about each character that players can relate to. In Grant’s case, he’s got that sense of wonder about him. He comes from a small town and this is his first experience living in a big city like San Francisco. I think that his background has really shaped how he approaches the events that unfold in the story and will provide for some unique and interesting interactions with the other characters. SHH: What is the game about? Farren: In a nutshell, the game is about giving players the ability to play a brand new Mutant character, select what their core power will be and then shape that character based on their decisions, actions and power customization choices. Ultimately, players will end up with different characters at the end of the game, even if they all started as Grant and chose the same core power. "X-Men Destiny" is all about customization and player choice. SHH: What type of gameplay does Grant have and is he designed for a particular type of player? Farren: Early on in development we had approached the design of the characters around a certain "archetype." One would be a melee specialist, another would be ranged, healer, etc. We ended up changing our philosophy to rely on the core power and customization choices to determine what kind of play style a given character would have rather than any sort of pre-set template. This gives players more options and allows them to play with any one of the characters and tailor them to their play style. For example, the Density Control core power is one that is perfectly suited for up-close melee fighting where the Energy Projection power provides more of a ranged attack. What we really get that is specific to each character is the deep backgrounds and personalities that come along with them. Grant may have different reactions and affinity to certain X-Men Universe characters than Aimi. I don’t want to spoil any of the story so I’ll let the players discover what those differences are as they play through the game. SHH: What sort of mutant powers does he have and how does he use them to his benefit? Farren: Again, "X-Men Destiny" is all about customization and player choice. A great example of customization is our X-Gene system. X-Genes are core powers that have been extracted from various X-Men Universe characters, which the player can collect and equip to enhance their abilities. Let’s say I picked up Surge’s offensive X-Gene and equipped it, my character would then receive an electrical energy damage bonus to all of their attacks. What’s even better is that you can spend experience and level up those X-Gene powers, which provides a lot of different options. So, the answer to this question is that it is really up to the individual player to choose which powers they want to use with Grant and what types of benefits they bestow. SHH: Does Grant have any weaknesses? SHH: What sort of associations does Grant have with other X-Men characters? Farren: One of the interesting things about having three diverse playable characters is that when playing as one versus another, gamers will have different experiences with each. While we don’t want to spoil any of the surprises, you can rest assure that each of our characters will have some unique interactions with the various franchise characters that they meet throughout the game. SHH: Does Grant have an arch-nemesis that seems to always find a way to oppose him? Farren: Being that "X-Men Destiny" is an origin story, there are no rivals or enemies that exist before the story begins. That said, players can make various choices throughout the game that will have a direct impact on their affiliation with different characters and factions present in the world. SHH: Can you talk about why Activision decided to include three original playable characters in this game rather than having franchise characters playable? Farren: One thing we wanted to focus on in "X-Men Destiny" is the notion of choice. When dealing with established characters they can bring with them certain established conventions that you need to adhere to. By using three original characters in "X-Men Destiny," we give players the option to create their own mutant character and introduce them into the "X-Men Universe." Gamers will have plenty of interactions with the established franchise characters that fans have come to know and love over the years. 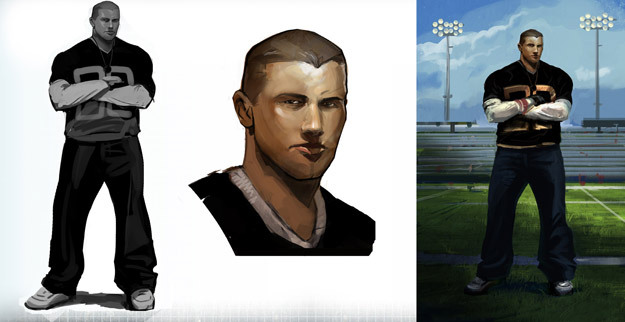 You can view larger versions of the above screenshots and concept art by clicking here! Visit the official website for more information on the game.